Sometimes it can be difficult to provide the exact settings of machine and water pump pressure because the (air, feed rate, and water pressure), can change due to humidity, length of hoses, different manufacturers fiber characteristics, etc. I will try to explain the “general concepts” when performing wall spray applications with the CM-1500 machine. Important: Be certain “all floors” are swept very clean so that no objects pass thru machine when collecting the recycle from floor. 1.) Adjust pump pressure to 350 p.s.i (#25015 tips). 2.) Open the slidegate setting to 2/3 open (‘locking pin’ in 8th hole open). 3.) Turn both blowers to #6 or #7 on the blower control dial. Note: these are approximate settings to start process. Further adjustments can be made after spraying the first 5 minutes or 3 to 4 wall cavities. 5.) Collect recycle in a 30 to 35 gallon plastic barrels (trash barrel) and return back to machine. (you will need some brooms and a large scoop shovel to do this). Layer fiber in machine with about 1/3 barrel recycle (damp fiber), to 1/3 bag of dry compressed fiber from bag. ( The ratio is about 2 parts dry to 1 part recycle /by weight). As you load a few layers into the machine, it helps to perform a little ‘stirring’ action with your hand manually, to help the two materials (recycle & dry) to mix better. This is done in the upper section of hopper to keep hands away from moving parts of the lower hopper. Note: this layering & mixing action is very important to create a homogeneous or constant blend when spraying the walls. If the fiber comes out of the nozzle for wet and dry intervals, the product will not stick to walls. You have to provide a very ‘even’ mixture at all times when spraying. When person spraying fiber becomes ‘skilled’, there will be less recycle fiber to return thru the machine. You may have to increase the ‘dry-to -damp’ recycle ratio. With dryer mixture, increase the water pressure since the fiber will have less moisture in the sprayed mixture. Adjust machine to use the recycle you make when spraying. At end of job you should only have one or two barrels of damp recycle to be used on next job, or blown in the attic area. Maintain fiber mixture as dry as possible with just enough moisture (water pressure) to make the fiber stick to the walls. The mixture should be slightly darker grey color than the dry fiber from the bag and slightly dusty. (If fiber mixture is a very dark color and heavy/ dense texture, it is probably too wet and the pressure at pump will need to be reduced in 20 p.s.i. to 30 p.s.i. increments. The air pressure from blowers needs to be turned up as high as possible to provide the high speed and velocity to stick the fiber to the walls at a high density. (Use the air pressure to provide the high impact of the fiber hitting the walls not higher water pressure). If the air pressure is turned up ‘too’ high and the fiber bounces off the walls, reduce air pressure settings on the blower control slightly. 7.) Begin spraying the fiber mixture, as close to the surface of the wall studs as possible. If excess fiber is sprayed beyond the wall studs, this overhung weight can cause the fiber to fall from the wall cavity and generate excess recycle to be used on jobsite. 8.) Scrub walls immediately following the sprayer to generate recycle for the machine. All of this must be performed in an even rhythm to keep all aspects of this operation flowing in a constant pattern. 9.) After the project has been sprayed and scrubbed, the sprayer may have to go back and perform some ‘touch-up’ fiber spraying to fill in any gaps or low areas so that a high quality application is provided to the customer. 10.) Optional: As a final step, the sprayer can go back over all sprayed surfaces with water spray nozzle at 350 p.s.i. (water only/ no fiber), and quickly overspray all fiber surfaces. When dry, the surface will form a ‘crusty’ harder surface layer that looks good for the customer when pressed with hand into the fiber surface. Note: The fiber moisture should not exceed 35% moisture content and should be left un-covered for as long as possible to allow the drying process. Usually; 2 to 3 days is sufficient, depending on the thickness of the sprayed walls. 20% to 25% before covering inner walls. Do not cover walls with plastic moisture barriers and avoid oil based paints on the drywall (gypsum board) inner walls. The walls need to ‘breath’ or allow moisture migration. 1.) The spray person will start at bottom of wall cavity, (position the spray nozzle 1/2 meter from wall surface at 90 degree angle (perpendicular to the wall plane), or directed slightly downward. Make sure to hold the nozzle with the water hose on the bottom (not the top). Move the nozzle back and forth in constant ‘stroke’ pattern (1 second intervals), and slowly step-up in upward increments as the cavity fills from lower section of the nozzle spray pattern. Important: the sprayer must maintain a very constant spray pattern with a constant rhythm. (similar to spray painting an automobile). This constant 1 second interval stroke pattern will provide additional mixing and blending effect of the sprayed fiber as it contacts the wall. 2.) 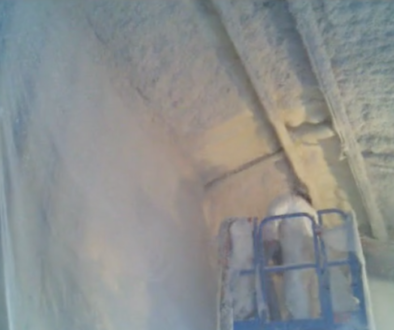 As sprayer advances to the top of wall cavity, the sprayer needs to change angle of nozzle, directed 45 degrees upward and move nozzle closer to wall to impact remaining crevice with high density packing effect. This will prevent the fiber from ‘sagging’ or forming a gap at the top of the wall cavity. Hopefully this information offers better details to make your experience successful!